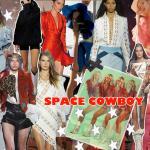 So we introduced our NEW Space Cowboy Look this week. Our First drop of printed sweatshirts, hoodies and tee’s are online now. This collection is just SASS! Think fitted skirts in PU fabric, lace up corset detail on skirts and ruffle tops, super cute star print fabrics all in hues of orange, rust, mint green and blues and of course it wouldn’t be Lola Loves if we didn’t add a few frills. So saddle up girls, channel your inner cowgirl and get ready for a hoedown!